Sunday October 22nd 1899 Will and I went over to Charlie Hedges for a little while. I got a little dinner as soon as we got home Julia had gone home. Anna & Nellie Murphy were came down in the afternoon and staid till after supper. 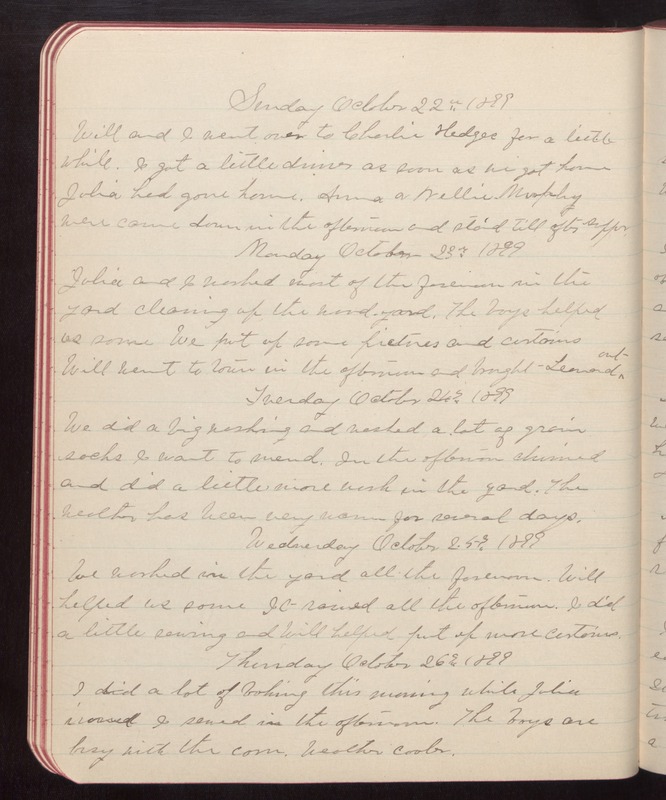 Monday October 23rd 1899 Julia and I worked most of the forenoon in the yard cleaning up the wood-yard. The boys helped us some. We put up some pictures and curtains Will went to town in the afternoon and brought Leonard out Tuesday October 24th 1899 We did a big washing and washed a lot of grain socks I want to mend. In the afternoon churned and did a little more work in the yard. The weather has been very warm for several days. Wednesday October 25th 1899 We worked in the yard all the forenoon. Will helped us some It rained all the afternoon. I did a little sewing and Will helped put up more curtains. Thursday October 26th 1899 I did a lot of baking this morning while Julia ironed I sewed in the afternoon. The boys are busy with the corn. Weather cooler.